Soak the cashew in water for some time. Drain the cashew and then put them into a blender. Add in ½ cup of rejuvelac, 1 teaspoon of salt, and ½ a teaspoon of xanthan gum. Purée them for a minute until it’s really creamy and smooth. Put the purée into the bowl. Let it sit at room temperature overnight, from 8 to 24 hours, depending on the room temperature and just let it culture. To thicken the culture, add in a tablespoon of agar powder into ⅔ cup of cold water. Whisk it really well so it dissolves and then let it cook for a couple of minutes until it’s thick and bubbly. Add the agar to the vegan cheese and blend it with a blender. Take an ice cream scoop and scoop out the mixture so it will form little balls, and then drop it into an ice bath. Put the balls with the water in the refrigerator, just for a few minutes for them to chill. Take the cheese balls out of the refrigerator and slice them up. 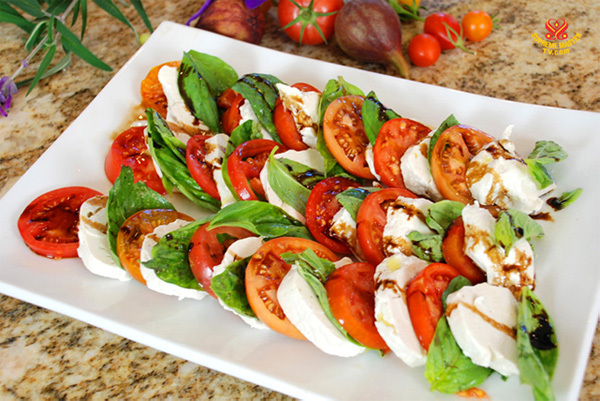 Arrange the caprese salad by making layers of vegan cheese, tomatoes, and basil. Drizzle it with a little bit of fine olive oil and some balsamic vinegar. Sprinkle a little bit of sea salt.